Brotherhood of Man are a British pop group who achieved success in the 1970s. They won the 1976 Eurovision Song Contest with "Save Your Kisses for Me". Created in 1969 by songwriter and record producer Tony Hiller, Brotherhood of Man was initially an umbrella title for a frequently-changing line-up of session singers. Early on, they scored a worldwide hit with the song "United We Stand". By 1973 the concept had run its course and Hiller formed a definite four-member line-up consisting of Martin Lee, Lee Sheriden, Nicky Stevens and Sandra Stevens. This version of the group went on to score many hits around the world in the mid to late 1970s including "Kiss Me Kiss Your Baby", "Angelo", "Oh Boy (The Mood I'm In)" and "Figaro". They achieved perhaps their biggest success in their native UK with three number one singles and four top twenty albums. The group under this line-up still continues, performing shows throughout Europe. Altogether, they have released 16 studio albums, with worldwide sales topping 15 million records. Brotherhood of Man were formed by record producer/composer Tony Hiller in 1969, and originally featured his co-writer John Goodison with Tony Burrows, Roger Greenaway, Sue Glover and Sunny Leslie. Greenaway was also a songwriter and had co-written hits such as "Something's Gotten Hold of My Heart" and "Melting Pot". Burrows was a well-known session singer, performing in various line-ups on hit singles such as the No.1 hit "Love Grows (Where My Rosemary Goes)" by Edison Lighthouse. The two female members, Glover and Leslie were an act in their own right, releasing singles as Sue and Sunny. The group came together in 1969 and began recording some songs with Hiller. Their first single "Love One Another" failed to chart, but the follow-up "United We Stand" (released in January 1970) was a worldwide hit. "United We Stand" was heavily played on British radio, and broke into the American market. The single became a Top 20 hit in the UK, Canada, and US. The song has since been used as the closing theme for television's Brady Bunch Hour and as an anthem for various causes. Burrows left the group soon after and as a four-piece, The Brotherhood of Man followed "United We Stand" with another hit, "Where Are You Going to My Love". The song charted in the UK, Canada, and US and has since been covered by Olivia Newton-John and The Osmonds among others. A début album United We Stand followed soon after. Over the next two years, the group continued in varied line-ups. Goodison left the group at the beginning of 1971 and was replaced by American singer Hal Atkinson, Greenaway left soon after and was replaced by Russell Stone. They had one more minor hit in the US (1971's "Reach Out Your Hand"), but experienced no further success in the UK and split after being dropped by their record company. Keen to keep the established name alive, Hiller set about putting a new line up together. In 1972 he got together a trio of session singers, Martin Lee, Nicky Stevens and Lee Sheriden. Sheriden was already known to Hiller as a songwriter and had a solo career. Lee had a solo single to his name and was a budding songwriter. Stevens had been classically trained, but had since adapted her vocals and was performing as a cabaret singer. The trio began recording together, but their first single, "Rock Me Baby", to be released at the end of 1972, was cancelled due to the release of the song by David Cassidy. Finally their first two singles "Happy Ever After" and "Our World of Love" were released in 1973. Neither single charted and soon after, another female vocalist was added to the line up, Sandra Stevens. Stevens (no relation to Nicky) had been performing as a big-band singer since a teenager in the late 1960s. She had sung with the Joe Loss big band and alongside Eve Graham (of The New Seekers) in club group, The Nocturnes. Now signed to the Pye spin off label, Dawn, the quartet released their first single, "When Love Catches Up on You" in January 1974. It failed to chart, but the follow-up single, "Lady" became a hit in Europe. Encouraged by this, the group set about recording their debut album. The album Good Things Happening was released later in the year along with two more singles, but none of these found success. 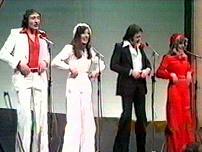 Before the record label folded, Brotherhood of Man released one more single in the Summer of 1975. This was the upbeat "Kiss Me Kiss Your Baby" and although failed to make an impression in the UK, became a big hit in Europe, reaching Number one in Belgium and Number two in the Netherlands as well as top 10 placings in other countries. Brotherhood of Man toured extensively in Europe, honing their stage act and harmonies, while Hiller, Sheriden and Lee worked on composing songs for their second album. Among them was a song Sheriden had largely written called "Save Your Kisses for Me". "..."Kiss Me Kiss Your Baby" was a hit all over Europe in '75. I firmly believe it opened the door for us a year later and helped us do well because they knew us – every weekend we'd travel to do TV spots in France, Belgium, Germany and Switzerland". The song became a major hit around the world and made No.1 in many countries and returned the group to the US Charts. The song eventually sold six million copies worldwide and is still the highest selling Eurovision winner ever. In the UK, it stayed at No.1 for six weeks and earned them a platinum disc. It ended up the top selling single of the year and is still one of the few UK singles to sell a million. The group had already recorded a second album and had been released in several countries a year previously. Following their victory, Pye released the album with "Save Your Kisses for Me" added. Entitled Love and Kisses, the album was a success in the UK, reaching the top twenty, as well as other countries, gaining a Number six position in Norway for instance. Soon after this, a follow-up single was released. Eager to cash in on their success, Pye decided against releasing anything from the album, as the earlier material had been more soul-based than the pop they were now successful with. The group instead released "My Sweet Rosalie" – almost a carbon copy of the previous hit, although the lyrical twist was that it was about a dog, rather than a child. The song failed to chart highly, only reaching Number thirty in the UK, but fared better in other countries, particularly Belgium where it made Number two. Concerned by the lack of success for the single, the record company did not release anything else in the UK for the rest of 1976, despite the fact that in Europe a new album of material was released along with singles in various countries: "I Give You My Love" in Germany, Spain and others and "New York City" in France. Early in 1977, the group released their next single, "Oh Boy (The Mood I'm In)". The song was a change to their previous hits in that it was female-led and much more in a contemporary pop style. The song was a hit in the UK, reaching the top 10 and fared well in Europe also. The album which had been released in Europe the previous year was now released in the UK with the new single added. The album, now titled Oh Boy!, did not follow their last album into the charts however. By now the public were picking up on their similarity to ABBA who were currently dominating the charts around the world, this perception was cemented with the release of their next single, "Angelo". Criticized by many for its similarity to ABBA's "Fernando", the song was released in the Summer of 1977 and was an instant success. The song rose to Number one in the UK Charts and became one of the biggest hits of the year as well as ending up among the 50 best selling singles of the decade. The group were invited to appear at the 1977 Royal Variety Performance, where they elected to sing "Angelo", rather than their then current single "Highwayman". Deprived of this vital promotion, the single failed to enter the chart (although was 'bubbling under' the top 50 at the time). It did however become a top 20 hit in both the Netherlands and Belgium. An accompanying album Images, similarly failed in the UK charts. The group battled on into 1978 with the release of "Figaro", which brought them back into vogue and became their third UK Number one single. Many critics argued however that this song was simply cashing in on the success of "Angelo", but although their titles are similar, there is little evidence to support this, as the two songs are very different. In May "Beautiful Lover" was released and another hit, reaching the UK top twenty, and spending three months in the charts. An album was released soon after, B for Brotherhood. The record company took no chances with this album, given the failure of their previous two, and so with a TV advertising campaign, the album entered the UK Charts, eventually peaking at Number eighteen – their most successful album so far. As the year drew to a close another single, "Middle of the Night" was released along with a greatest hits compilation, Twenty Greatest. Apart from featuring all their own hits and a smattering of album tracks and new songs, the group re-recorded both "United We Stand" and "Where are You Going to My Love" for the album. Twenty Greatest became Brotherhood of Man's most successful album, reaching Number six in the UK Charts and spending fifteen weeks in the top 75. 1979 saw the group going into decline as the hits dried up. Three singles released in the first six months of the year all failed to make the charts as did their next album, Higher Than High. This was despite regular TV appearances and radio play, although the group remained popular on the live circuit.". As Pye Records were due to fold at the end of the year, one more album was released in December to fulfill their contract. The album Singing a Song was made up of unreleased songs mixed with new material, but no singles were released from the collection. Manager Tony Hiller set up his own record company in 1980, Dazzle Records. Brotherhood of Man released the first single on the label, "Honey Don't Throw Our Love Away" which also did not chart, nor did the follow-up, a cover of the 1960s hit "Will You Love Me Tomorrow". An album was recorded but went unreleased, except for in Australia. Towards the end of the year, the group were offered a deal with Warwick Records to make an album of cover versions. Released in November, Sing 20 Number One Hits was the group's take on 20 number one UK hits from recent years. The album was a hit, peaking at No.14 – their biggest chart success for two years. The album remained in the top 50 for two months and was awarded a gold disc for sales of over 100,000. Keen to release a follow-up, Warwick offered them a double album deal the following year. Released as a buy one get one free package, 20 Disco Greats / 20 Love Songs – again, a collection of recent chart hits, came out in late 1981. This album did not match the success of the first and missed the UK Charts. Tracks from these albums appear frequently on CD releases of the group, interspersed with their own hit singles. In early 1982, Sheriden opted to leave the group to study for a degree in music. Hiller took on 28-year-old Barry Upton, an up-and-coming songwriter. Upton was later to write hits for many artists including Sonia and Steps. The previous year, the UK had won the Eurovision Song Contest (the first time since Brotherhood of Man) with the two boy/two girl pop act Bucks Fizz. Within twelve months they had chalked up three number one singles and encouraged by their popularity, Hiller set about reviving Brotherhood of Man's fortunes. In 1982, Brotherhood of Man signed a deal with EMI in the hope that the new pop revival would encompass them. Armed with a new single "Lightning Flash", written by Hiller, Lee and Upton, the group were relaunched with a new contemporary image and sound. The song only reached No.67 in the summer of 1982, but was their first single to chart in nearly four years. A follow-up, "Cry Baby Cry" failed to capitalise on this, but nevertheless, the group began working on a new album. In 1983, the songwriting team of Hiller, Lee and Upton entered a song for the A Song for Europe competition. Their composition, "When the Kissing Stops" made it to the final eight, but although initially tempted, the group decided not to perform the number themselves ("We all agreed it would be better to be remembered as winners, and we couldn't bear to lose!" remembers Sandra Stevens). Hiller formed a male/female trio under the name Rubic to represent the song on 24 March 1983. The group lost out to another male/female trio, Sweet Dreams and ended up in fifth place. Despite its failure, Brotherhood of Man recorded the song and chose it as their next single. Released in the Summer of 1983, alongside their new album Lightning Flash, neither record made the UK Chart and this brought to an end their contract with EMI. "When the Kissing Stops" remains Brotherhood of Man's final single release. Brotherhood of Man continued to perform in concert throughout the UK and Europe, but less than a year later, Upton elected to leave to work on other projects and the group decided to split. This ended their twelve-year working relationship with Hiller. In 1985, Brotherhood of Man reunited for a one off TV appearance and they discussed getting back together. Over the next year, and now back with Sheriden in place of Upton, the group decided to manage themselves and begin performing again. In late 1986, the group were back on the live circuit, but decided against attempting a chart comeback. In 1990, Martin Lee got together with songwriters Paul Curtis and David Kane to compose a musical based on The Butterfly Children books by Angela and Pat Mills. The musical had its world premiere at the Mitchell Theatre in Glasgow, to open the 1990 Glasgow City of Culture and ran for a month and was performed by the Mitchell Theatre for Youth. Just three months later, the show transferred to the larger Kings Theatre in Glasgow and ran for two weeks. The show transferred in late 1992 to London's West End. Brotherhood of Man recorded the songs themselves and the nineteen track collection, available on cassette only, was available to buy at the theatre. The album was never commercially released, although some tracks did make it onto tie-in cassettes to go with the books a few years later. The Butterfly Children, essentially a children's show, featured many differing styles of music from rap to rock and country and western to the more familiar pop the group were known for. The show's run ended after a short season, and has not been performed since. In 1991, the group went back into the recording studio and made an album of re recorded hits and some new material with Dutch producer Eddy Ouwens. Not only was this their first recording for eight years, but it was their first without Hiller. The album remains unreleased in the UK, but was released in Spain under the title Grandes Exitos and in some other countries as The Golden Hits of Brotherhood of Man. The group continued to perform live throughout the nineties mainly on the cabaret circuit and Holiday Camps such as Butlins. In 1997, they recorded another album, based on their live show. Again, the album contained re-recordings of their hits as well as cover versions that they perform in concert, such as "1999" by Prince and "Juke Box Hero" by Foreigner. The album contained one new song, the title track "Greenhouse", rescued from the 1991 sessions. Like the previous album, this was never commercially released and was only available to buy at their shows. As the 2000s dawned, the group went into semi-retirement and cut back on touring. However, in 2002, they devised a new live show based on their roots in the 1970s. Entitled The Seventies Story, the show comprised a trip through the decade, with the group performing well known songs from each year along with a narration of contemporary events. The group returned to the studio and recorded an album of the show's songs. Again, this album was not released in shops, but was available on CD at the show's venues. The tracks did get a general release later on however on various compilation albums. In 2004, the first Brotherhood of Man DVD was released, featuring TV performances of many of their singles. To date, the group still do occasional shows with both The Seventies Story and with their own material. Most recently they have teamed up with the current incarnation of Bucks Fizz and together they perform as a two-part show. They frequently play to sold out houses, The Seventies Story being particularly successful in receiving good reviews. Brotherhood of Man still find themselves in demand on both the Nostalgia and gay circuit. They have appeared a number of times at London's G-A-Y theatre and regularly appear on TV both in the UK and abroad, mostly around Eurovision time each year. In 2006, they appeared at the 50th anniversary of the Eurovision Song Contest gala held in Denmark, where they were voted in the top 5 Eurovision songs of all time – the highest of any UK entry. In 2009, Cherry Red Records released the first four albums by the Eurovision line up as two double CDs. This was the first time these albums were available on CD. ^ Emusic. "Biography – Early line-up info". Retrieved 5 May 2008. ^ Alwyn W Turner. "Glitter Suits and Platform Boots – Tony Burrows". Retrieved 22 December 2011. ^ DragonDiscs. "Deram single releases – inc. singles by Sue and Sunny". Archived from the original on 4 August 2009. Retrieved 9 December 2008. ^ CherryRed. "United We Stand – Brotherhood of Man". Archived from the original on 14 March 2008. Retrieved 2 May 2008. ^ a b c Official Tony Hiller website. "Brotherhood of Man Biography – Early line-up". Retrieved 10 October 2008. ^ John Tracey, 1995. "United We Stand album review". Retrieved 2 February 2009. ^ Brotherhood of Man Dutch website. "Biography – Release of "Rock Me Baby" pulled". Archived from the original on 6 October 2008. Retrieved 26 September 2008. ^ Lyn Paul official website. "The Nocturnes featuring Sandra Stevens". Retrieved 2 December 2008. ^ Vinylnet Records. "Dawn Records discography". Archived from the original on 10 February 2013. Retrieved 12 July 2008. ^ Radio 538, Netherlands. ""Lady", Dutch Charts 1974". Archived from the original on 11 March 2009. Retrieved 6 February 2008. ^ Radio 538, Netherlands. ""Kiss Me Kiss Your Baby", Dutch Charts 1975". Retrieved 2 June 2008. ^ Austrian charts. ""Kiss Me Kiss Your Baby" Austrian Charts". Archived from the original on 16 January 2009. Retrieved 30 August 2008. ^ Gordon Roburgh. "A Song for Europe 1976". Archived from the original on 16 August 2012. Retrieved 10 October 2008. ^ a b c d e f g h "Brotherhood of Man – Official Chart History". Official Charts Company. Retrieved 19 January 2016. ^ All Kinds of Everything. "1976 Eurovision Song Contest overview". Archived from the original on 2006-01-16. Retrieved 21 June 2008. ^ "Interview with Lee Sheriden". BBC News. 20 May 2005. Retrieved 20 September 2008. ^ ""Save Your Kisses for Me" US Chart details". Billboard. Archived from the original on 30 June 2013. Retrieved 18 July 2008. ^ wwwk.co.uk. "UK Number One singles of 1976". Retrieved 2 August 2008. ^ Official Charts company. "Get Lucky becomes one of the UK's biggest-selling singles of all time". Retrieved 26 April 2017. ^ UK charts.com. "UK best selling singles – additional sales confirmation". Retrieved 6 July 2008. ^ Norwegian charts.com. "Love and Kisses, Norway chart details". Retrieved 12 June 2008. ^ Brotherhood of Man Dutch website. "European single releases". Archived from the original on 6 October 2008. Retrieved 26 September 2008. ^ BFI.org.uk. "Royal Variety Performance 1977". Retrieved 2 June 2008. ^ Brotherhood of Man Dutch website. "Discography – Good Fortune release". Archived from the original on 6 October 2008. Retrieved 26 September 2008. ^ BPI. "Searchable database – search "Brotherhood of Man"". Archived from the original on 14 May 2011. Retrieved 22 December 2011. ^ Songs 4 Europe.com. "1983 A Song for Europe". Archived from the original on 5 April 2013. Retrieved 20 July 2008. ^ Oldies.com. "Brotherhood of Man Biography". Retrieved 20 June 2008. ^ ESC Today. "Information on The Butterfly Children". Archived from the original on 14 January 2009. Retrieved 29 July 2008. ^ Brotherhood of Man official website. "The Seventies Story". Retrieved 16 August 2015. ^ "Brotherhood of Man Greatest Hits DVD". AllMusic. Retrieved 23 October 2009. ^ Official website. "Brotherhood of Man concert dates". Retrieved 16 August 2015. ^ Official website. "Bucks Fizz and Brotherhood of Man tour". Retrieved 16 August 2015. ^ Official website. "Selection of concert reviews". Retrieved 16 August 2015. ^ Thurrock. "The Seventies Story live show review". Archived from the original on 13 January 2009. Retrieved 18 July 2008. ^ BFI. "Brotherhood of Man filmography". Retrieved 3 August 2008. ^ Myledbury. "Eurovision 50 Years anniversary special". Retrieved 12 December 2008. "Where are You Going To My Love"
"When Love Catches Up on You"
"Kiss Me Kiss Your Baby"
"Oh Boy (The Mood I'm In)"
"Honey Don't Throw Our Love Away"
"Toi, la musique et moi"
"We'll Live It All Again"
"Uma flor de verde pinho"
"Chansons pour ceux qui s'aiment"
"Ne mogu skriti svoju bol"
1978: "Rivers of Babylon" / "Brown Girl in the Ring" – Boney M.